The new dynahold precast concrete retaining system lends itself very nicely to a situation where a structural wall is needed and where a normal spread footing creates a room problem. 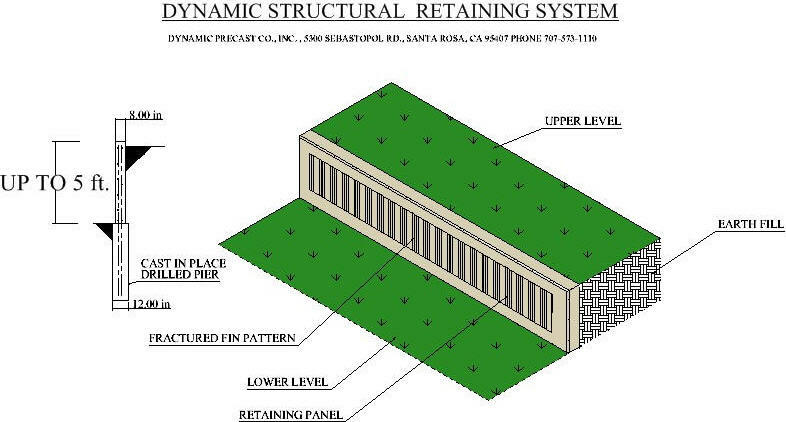 The dynahold system is a precast panel system which uses no columns, and is anchored into drilled vertical piers only 12” in diameter, and at every 4 ft. along the wall line. This is a “set and pour” system where the piers are drilled, and the panel hoisted into place BEFORE the concrete is poured into the pier. (The panel is set on small concrete pads located along the wall line between the pier holes. After setting and bracing the interlocking precast panels, concrete is pumped into the piers to complete the system. (A very effective and economical way of building a structural wall with a very narrow footprint.) The panels come in 4 ft, 8 ft. and 12 ft. lengths and can be obtained up to 6 ft. high. For convenience in transportation and handling, the pier rebar connection is accomplished using threaded rebar technology where the pier rebar is attached to the panel just prior to setting the panel in place.